Peatross Miss USA as I like to call her, I always seem to want to pay echo on this card. The only thing that makes this card vulnerable is that it dies to Flametongue Kavu. Besides that, she's saweet. A 4.5 in both limited and constructed. For a long time I waited for a card like this to come along in my favorite colors. Of course, it came along right after I quit magic. Same with Prophetic Bolt. Makes me sad - since Star Spangled Slaughter would have been my favorite deck of all time. Angel Rating: Hark, the herald angel sings! Andrew Chapman This might be my favorite angel. She flies, doesn't tap to attack, and is a force on defense and offense. Too bad she seems to have a bulls-eye on her chest for FTK to shoot at, though. In Limited, drafting her early and expecting to play her defines what colors you are drafting and therefore she might not be a solid pick early in the draft. In sealed, she is a definate reason to play URW, but not a necessity. Unlike yesterday's angel (Desolation Angel) this card was great in both constructed and limited IBC block decks. A 3/4 for 1RWU was very doable in IBC because all 3 colors had great cards plus opposing colors had dual lands and many good gold cards requiring some mix of RWU. The haste and no tap to attack were just very nice bonuses. I am not sure she fits into the current type 2 metagame in any meaningful way but if there is a viable 3 color RWU deck she would certainly merit a slot in it. She also had cool art and RWU is great because it is patriotic in a sport filled with commie pinkos and the Godfather loves America. Watson Well this angel is definitely one of the more fun ones we have covered this week. 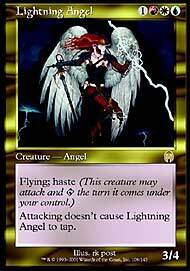 The only downfall is that Lightning Angel happens to have the drawback of having three colors. The decks that do play it (such as Star Spangled Slaughter) put it to full use. 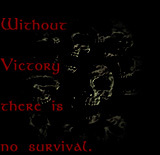 Also, the fact that is has haste can be crucial is some situations. Switching gears to limited is a bit different. As good as this card is in constructed, the three color problem can be worse in limited. It's not completely unreasonable though. I would consider taking it. The priority it would have would depend on how my draft had gone to that point. If I were to open it first pack, it might just be worth taking and forcing three colors just to play it. Lightning Angel has 'solid' written all over it. Not literally, but the 3 abilities make it a great blocker and an evasive attacker. The mana cost is low at 4, but the 3 colours mean that you'll only see this angel in a slim variety of decks. Lightning Angel is a very useful card, but it won't win games by itself. In constructed, look out for slow decks to play this as a win condition. I can't see it as too high a pick in limited, thanks solely to the 3 different colours needed.